MINNEAPOLIS, MN--(Marketwired - Mar 12, 2015) - Couples agree that weddings at one Minneapolis hotel are done better than the rest. Courtyard Minneapolis Downtown offers versatile event space, adaptable for large or small ceremonies and receptions. This brand new event space is ornamented with on-trend décor that makes any wedding reception feel modern, yet timeless. This year, the experts at WeddingWire have recognized Courtyard Minneapolis Downtown among the top five percent of local wedding professionals in the WeddingWire Network. Voted on and reviewed based on quality, service, responsiveness, and professionalism, this award is determined by local couples. The Courtyard Minneapolis Downtown hotel is excited to announce this distinction, and remains dedicated to providing couples with refreshing new takes on wedding ceremonies and receptions. 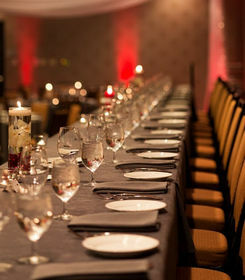 Part of what sets this downtown Minneapolis wedding venue apart is the attentive service provided by the hotel's staff. Headed by Director of Catering and Convention Services, Lisa Heim, the hotel's event staff is committed to creating an experience that exceeds expectations and providing a personalized service that is as special as the celebration. Equipped with a rigorously earned Wedding Certification, Courtyard Minneapolis Downtown's Marriott Certified Wedding Planner is trained to help every couple formulate and execute a vision for their special day. Receiving perfect 5-star reviews from local couples on the WeddingWire Network, this hotel in Minneapolis, Minnesota specializes in satisfaction. Expectations were high after the completion of a 17 million dollar renovation project, but the venue and event staff have not disappointed. Reviews are glowing. One WeddingWire user was thrilled with his event. He writes, "The rooms, the staff, the set-up of the ballrooms were all top notch. I would recommend Lisa and the Courtyard Minneapolis Downtown to anyone that is planning on a meeting or party! WONDERFUL!" It's clear that Courtyard Minneapolis Downtown deserves this award and is a premiere wedding venue for area couples. Couples can visit http://www.weddingwire.com/biz/courtyard-by-marriott-minneapolis-downtown-minneapolis/5ee97f41312e59cc.html to schedule an appointment with Lisa. New to Minneapolis, the Courtyard Minneapolis Downtown offers travelers inviting, freshly appointed accommodations. Easily accessible, the hotel is conveniently located just off of major area highways and just a short 12-miles from MSP International Airport. Local attractions abound, as the hotel is just a short walk from downtown must-sees like Guthrie Theatre and Mill City Museum. The stylish downtown hotel features stunning views of St. Anthony falls, combining natural beauty with functional modern amenities. The hotel's 10,000 square feet of event space has been beautifully renovated, while their 5,200 square foot, elegantly appointed Grand Ballroom has been recognized by local couples as an outstanding venue for weddings. The on-site restaurant, The Bistro is the perfect stop for breakfasts, while offering a diverse dinner menu and a variety of cocktails. Guest rooms are designed for comfort and functionality. Plush bedding and ergonomic chairs enhance the comfort level of every room, while spacious desks and free WiFi make sure work can always get done. For modern amenities, welcoming aesthetics, personalized service, and a timeless experience, travelers and locals seek Courtyard Minneapolis Downtown. This year, the experts at WeddingWire have recognized Courtyard Minneapolis Downtown among the top five percent of local wedding professionals in the WeddingWire Network.